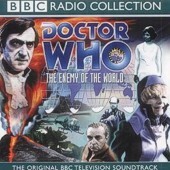 Appearances: "The Enemy of the World" and "Heralds of Destruction"
History: Although Salamander’s essential plans and ambitions were relatively straightforward, he is remembered by fans for two very distinct reasons; not only was he the only human villain faced by the Second Doctor during the ‘year of monsters’ of 1968 - every other adversary The Doctor faced during this time was an alien of some sort -, but he was also the exact physical double of the Second Doctor (Although he had a distinctive accent due to his Yucatanian childhood that The Doctor claimed he would take a month to mimic exactly, even though he was able to convincingly mimic it during his time posing as Salamander). When The Doctor first learned about Salamander, he was the head of a World Authority in the not-too-distant future, famous for having solved world hunger by his invention of the sun-store, a device that collected energy from the sun and stored them in a concentrated form that he could later direct to areas starved of sun. However, his benevolent public facade hid an assured arrogance, possessing a taste for fine wine from Alaska as well as being a cold-blooded killer with a lust for power. His desire for control was so great that he was actually willing to kill potentially millions of innocent people just so that he could ensure that he would have power over the few thousand that were left in the aftermath. This attitude eventually created Salamander’s enemy in the form of Giles Kent, the former Deputy Security Leader for North Africa and Europe and Salamander’s former right-hand-man, who was discredited and ruined by Salamander to ensure that nobody else realised what he was up to. Attempting to gain control of Salamander’s plans for himself, Kent was given a unique opportunity when the TARDIS materialised on an island near Kent’s base, as the Second Doctor was Salamander’s exact physical double, prompting Kent to convince The Doctor to pose as Salamander to access his main research station and find out what he was up to, The Doctor’s companions Jamie McCrimmon and Victoria Waterfield infiltrating Salamander’s retinue as new members of his staff after Jamie averted a fake attempt on Salamander’s life. Subsequent developments revealed that Salamander could apparently predict natural disasters such as a dormant volcano becoming active, subsequently blackmailing various public officials to hand power over to him or be accused of ineptitude for ignoring his prior warnings. While The Doctor discovered some of Salamander’s files of blackmail material, Jamie and Victoria learned that Salamander was causing the natural disasters thanks to a small group of people that he had tricked into confining themselves in a secret bunker while claiming that there had been a nuclear war that had devastated the planet. Not only did this secure him the loyalty of at least some of Earth’s population even if he had to destroy the rest to establish his power, but he also ensured that they possessed only what information about the outside world he was willing to share with them, claiming that Earth’s surface was a nuclear wasteland populated by ruthless mutants that the scientists were helping him eliminate. Fortunately, The Doctor’s allies ran into one of the scientists after Salamander brought him out of the bunker to kill him - the man having discovered a stray newspaper cutting that threatened to expose Salamander’s lies -, providing them with the necessary information to realise what Salamander was really planning. At the same time, The Doctor was able to deduce the truth about Kent due to the ease with which Kent was willing to resort to murder to get what he wanted, concluding that Kent simply wanted to take Salamander’s place. Having convinced some of Salamander’s staff that he was the monster he was underneath his facade by ‘interrogating’ Jamie and Victoria while posing as Salamander and using their genuine fear of him as evidence, The Doctor pursued Kent and Salamander into the now-deserted bunkers, Salamander setting off bombs to try and kill The Doctor and Kent. In a desperate attempt to escape, Salamander attempted to trick Jamie and Victoria into thinking that he was The Doctor after his escape from the mines, but this deception fell apart when he was brought to the TARDIS and he gestured to Jamie to activate the controls, something that the real Doctor had always expressly ordered Jamie not to do. When the real Doctor arrived, having escaped the explosions relatively unharmed, Salamander tried to escape by setting the TARDIS in flight, but in his haste and ignorance he neglected to close the door before the TARDIS dematerialised, with the result that he fell out of the ship and into the Time Vortex, The Doctor and his companions nearly sharing his fate before Jamie managed to close the doors ("The Web of Fear"). Although The Doctor assumed that this would leave Salamander drifting in the Time Vortex for all eternity, The Doctor later learned that in reality, Salamander had been caught in the TARDIS's temporal wake and followed the TARDIS to its subsequent destination of 1960s London ("The Invasion"). Although restricted to only his immediate possessions when he arrived in the past, Salamander was able to use the few weather-controlling nanites he had left on him to gain the necessary financial resources to establish a power base in this century. Using his new resources, he gathered all the information he could about The Doctor, even learning about The Doctor's regeneration, exile to Earth and employment by UNIT ("Spearhead From Space"), even managing to plant monitoring devices in The Doctor's laboratory that allowed him to witness The Doctor's interaction with his predecessor during the Omega crisis ("The Three Doctors"). Having gained a degree of insight into Time through his brief experience in the time vortex, Salamander had already made some progress in manufacturing his own time machine, but eventually decided to use his nanites - once again operating in large numbers - to unleash an apparent alien invasion on London. With the invasion as a pretext, Salamander infiltrated UNIT by posing as the Second Doctor (The Doctor later speculated that his senses were addled by his exile to account for the fact that he didn't realise that Salamander was not his past self), infecting Jo Grant with a small group of nanites to keep The Doctor distracted while he carried out a final analysis of the TARDIS. Having gathered the last of the information he needed to create his own time machine, Salamander travelled back in time another century to 1868, with the goal of using his enhanced technology to set himself up as the 'advisor' to the rulers of that era, convinced that it was now his right to set humanity up as the new Lords of Time. However, his deception was exposed by the Master- who had been suspicious at an invasion of aliens he knew absolutely nothing about and could also confirm that there had been no temporal activity to account for the appearance of the 'Second Doctor'- who was able to help UNIT track down Salamander's base before he went back in time, allowing The Doctor's UNIT allies to follow Salamander. Confronting Salamander in the Houses of Parliament as he attempted to demonstrate his nanites to the local politicians, The Doctor revealed that he had actually managed to convince the nanites that Salamander had earlier used to 'infect' Jo to see him as a friend rather than lash out due to fear of their circumstances. While Salamander had attempted to cut them off from his wider nanite network before they could 'infect' the other nanites with The Doctor's views, The Doctor was able to use his nanites to exert control over the others at short range, with he and the Master subsequently cutting off Salamander's access to the nanites completely. Although the Master escaped, Salamander was captured and his base taken back to the present while The Doctor took the nanites to an uninhabited world where they could make some kind of civilisation for themselves. Salamander was able to effect an escape from prison with the last of his nanites, but with his true agenda and presence in this time so publically exposed, it is unclear if he has the resources to be any kind of threat in the future.